We recently completed staircase graphics for Chicago Academy Elementary School. 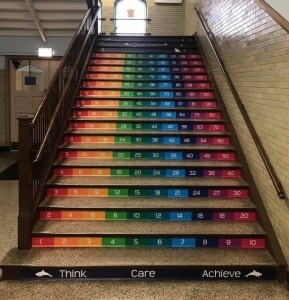 They were looking for a fun way to decorate their stairs. These rainbow inspired math sequences are just what they needed to brighten up the hallway. They included the school slogan and mascot to really personalize the design. Staircase graphics utilize the conformability and durability of wrap film to add a personal touch to any set of stairs, indoors or out. They are printed on high performance vinyl that is designed to handle the wear and tear of a high-traffic area. Stair decals can be printed with a repeating message or logo, or they can be designed as pieces of a larger image. The school opted to go with a segmented design that works with the number strips they wanted to display. Signs for Success designed and printed the stair decals and shipped for installation on site. Thanks to our friends at Divine Signs for getting the installation done. “This morning I was able to cut the ribbon on our new stairs at school! Designed by Signs for Success Inc., installed by Divine Signs and Graphics, Inc. and funded by 38 donors through DonorsChoose.org. Here’s to brighter hallways and brighter students!” Chicago Academy Elementary School’s Elizabeth Brown posted. 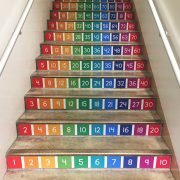 Turn your stairs into a unique and eye catching display. We can help in every step of the process. Whether you’re local or across the country, we can turn your stairs into a work of art. Signs for Success is a locally owned family business in Spokane. We strive for excellent customer service, perfect color, and quick turnaround on every project. Our large production facility allows us to design, print and install everything in-house. Get quality service and quick turnaround on staircase graphics; contact us for a free quote today!